Thursday October 30, 2008 was the start of what will be the annual Captain Tony Days. 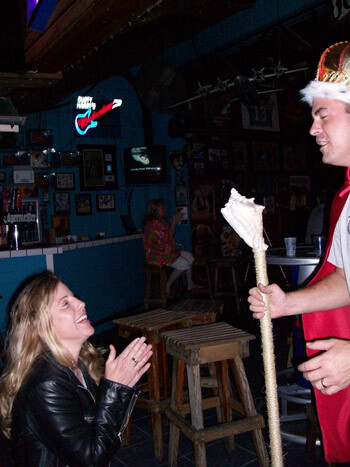 Sean Fisher was on hand knighting attendees as the Crown Prince of the Conch Republic, standing in for his Grandfather Mel who was the King of the Conch Republic. We are sad to say that the festivities were held just two days before Captain Tony passed away at the Lower Keys Medical Center at the age of 92 surrounded by his family and friends. He leaves behind a strong legacy here in Key West and will be greatly missed. He has gone to be with the other Key West Greats who passed before him, including Mel Fisher. The two old friends are likely enjoying a cocktail together looking down on what they have left behind and enjoying the fact that they are remembered so lovingly. They are right there with us every time somebody raises a glass to toast their names. So next time you have a drink in your hand toast to Captain Tony and then again to Mel!